What is the bane of the at-home worker? If you don’t have a home office the absolute worst is to find yourself at a kitchen table and your laptop sliding around the table top and your wrists resting in last night’s macaroni as you scramble to make a deadline. Don’t be this person. Sure you may not have a ‘home office’ but you can get your wrists off the table and at least give yourself a nice looking laptop stand that will allow you to get your work done in style. Also, when you are working, you want to be comfortable. Whether you are using a computer, reading a book, or writing something down, you do not want to be in too much pain. It can make you less productive, and you can end up causing real harm to your body. There are a number of different ways for you to stay comfortable. Maybe you will find a good chair or couch to work on. Maybe you will move to a bed. Whatever the case, you should never have to strain yourself too much as you work. In this update we've included three new products and also have a newest best value product if you need a stand but don't have too much money. As always we've updated the links and made sure we've got the best of the best on this list, so come on in, you'll find something you'll love. If you find that you can never get your laptop to rest on the right height or angle in order to maximize your comfort, then you definitely want to consider getting yourself a laptop stands. Laptop stands allow you to adjust your laptop, ensuring that you are at ease as you work on your laptop. According to most doctors and scientists, it is healthier for you if the screen of your computer is level with your eyes, which is impractical if you have a low desk, low chair, and long torso. Unfortunately, if your screen is not level with your eyes, then you may end up slouching, which is terrible for your posture. Slumping over too often can end up hurting the muscles and joints in your neck, back, and shoulders. Therefore, your body will thank you if you get yourself a good laptop stand. By using a laptop stand, you can raise your computer so that it is eye level. Your health and comfort will improve, which can also help you relieve stress and increase how productive you are while you are working. There are many different designs, shapes, sizes, styles, and colors, so you should find a model that works well for both your body and your computer. There is also a wide range of prices for you to make sure you can find a product on the market that is within your price range. All you must do is figure out your needs, and it should be pretty easy for you to find the laptop stand that will work best for you. The Rain Design mStand and mStand360 are portable, durable, and stylish. They hold many different types of laptops and can even support plenty of other objects if you need it to. One advantage of the design of the Rain Design mStand laptop stand is that it is made from an aluminum material that will help to prevent your computer from overheating. You can adjust both the tilt and the height of this laptop stand to ensure that you are as comfortable as you can be while you work. 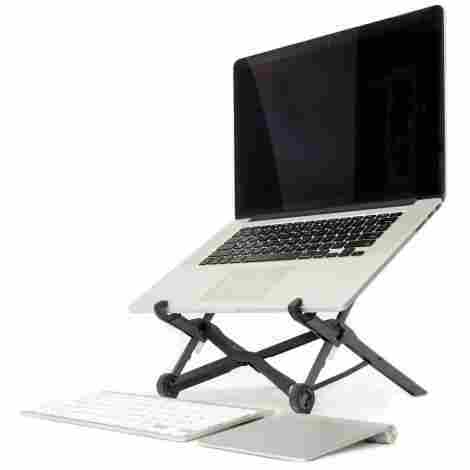 Whether you are on your bed or at a desk, this laptop stand is going to work well for you. It is not the cheapest option on the market, but the price is reasonable. It is made from heavy duty durable material, so it will last a long time. You can also rely on it to ensure your comfort. It comes in three different colors. It comes in two different stands. It comes with a keyboard stash. The rubber bumpers will not last as long as the rest of the stand. The stand can start to droop over time. The Samson LTS50 is a laptop stand with 15 x 11 silicon surface laptop tray designed to support your laptop and hold it securely in the right place for you. 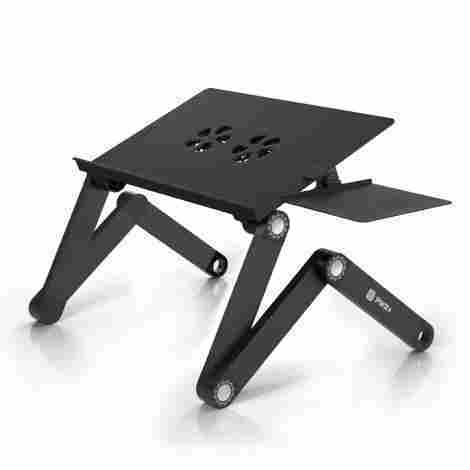 The sturdy heavy duty three-legged base is designed to go on your floor and hold your laptop steady. The roadworthy steel construction means that this base is going to very durable. 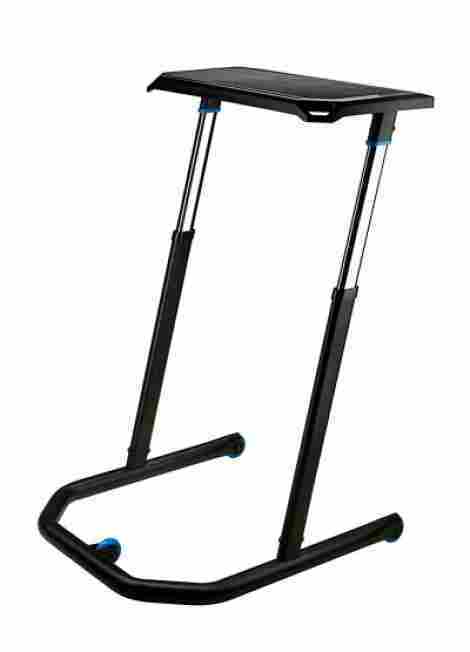 This laptop stand was designed to help you alternate between standing and sitting as you work. After all, sitting for too long can be detrimental to your health. Therefore, is very easy to significantly alter the height. 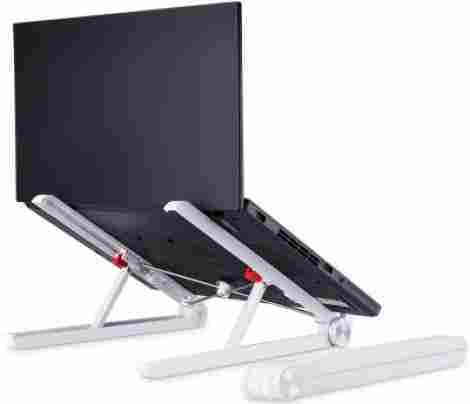 You can buy this laptop stand for quite cheap. A simple little number but really just what you need if you’re looking to get your laptop off the table and give your typing fingers and hands a break. 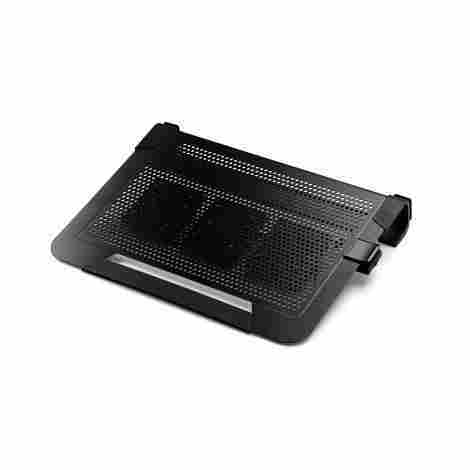 We like the non-slip protective pads and the turned up ends that keep your laptop in place. And the lifetime guarantee isn’t so bad either. According to the smarty-pants people who give you your stand-up desk and your ergonomic chair 16 degrees is the perfect angle for you to be eyeing your laptop. We’ll take iQunix’s word for it and say that it’s important to them to point out that 16 degrees is the scientifically perfect angle for comfortable typing and watching and this stand hits the mark. This is compatible with all laptops up to 17 inches and if for some reason it doesn’t work, just send it right back and they promise they’ll take it back right away. And don’t worry about if you have an off brand laptop, iQunix says this will work with almost everything from MAcBooks, to iPads, to Dell’s whatever your computing with, this should work well with it. Cheap is the word with this little baby, and yet it looks solid and well-made. So for the money it’s a real steal, which is why it made our best value pick. So if you don’t have too much money but are stuck working at the kitchen table (like freelance writers often do), then this would be a nice little stand to help get ease your work day, and your carpal tunnel from all you feverish tapping. While this is not technically a laptop desk, we included it because it allows you to work pretty much anywhere including while doing some cycling on your indoor trainer. The height is adjustable, and while it’s not much more than a flat plate on lets, it’s designed to let you slide it under a table or under a stationary bike or whatever you need to keep you working. With the push of a button the desk moves up and down really easily. So for the vertically challenged, or the head in the clouds NBA star this desk should rise or fall as you need. Plus it comes with wheels which allow you to move it around as necessary. This is another nice add-on that we like. Holes in the desk assembly allow you to keep your cables fairly organized into one place. It’s a nice way to keep your tech from getting tangled in your bike wheels if you happen to be pedaling while typing. It isn’t cheap, but it is a really nice high quality product. If you just have to get that work out in, or if you just have to stand while you work this is a nice way to get it all done. The table is nicely designed and it has a deep oval stand that allows you to slide it past much bigger things, specifically an exercise bike. 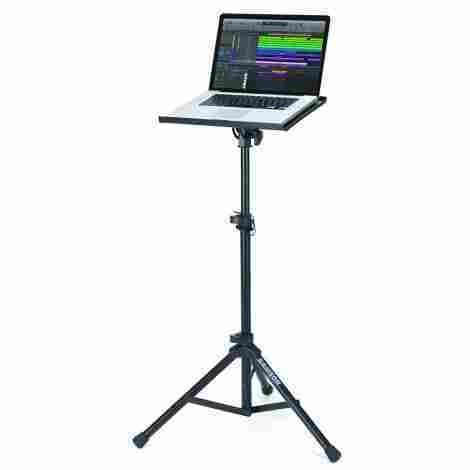 The Roost Laptop Stand is an adjustable and portable laptop stand has a universal construction, which means that it works well with many different types of computers of any brand, style, and size. This laptop stand is great for preventing strain on the neck of taller individuals. You can lift your laptop a full twelve inches, so you will no longer have to hurt your neck, back, and shoulders by looking down or leaning forward too much as you work at your computer. It has a collapsible design, which means it can fit anywhere. Additionally, the design is extremely lightweight, which means that you are not going to have any trouble carrying this laptop stand around. It is not cheapest stand out there, but you can expect this laptop stand to be especially easy to use, sturdy, durable, and reliable. As the name suggests, this laptop stand is ideal for preventing your computer from getting too hot, making it perfect for you if you use the laptop for activities that require a lot of performance. The three moveable fans that spin very quickly to get rid of all the heat coming from your laptop. You can be assured that these powerful fans are going to keep your laptop cool. The aluminum design is thin and light, so you can very easily pack up this laptop case and carry it. It can easily go wherever you and your laptop goes. This heavy-duty case is going to cost you quite a bit, which means you only need this laptop stand if you have a serious problem with overheating with your laptop. This ergonomic laptop stand is designed to ensure that you are comfortably and healthily seated while you work. It has a maximum height of 12.6 inches and a minimum height of 9.4 inches. You can do quite a lot to adjust this laptop stand. You can extend the height, and you can tilt the tray. With the auto-lock design, you will be able to ensure that it does not wobble around. You can fold up the Avantree Laptop Stand quite easily, which means that it is ideal for travel. Its lightweight build also helps with making it as portable as possible. This laptop stand is going to cost you a pretty reasonable price. The quality is good, and it will definitely work well, so you should be very satisfied with what you get. This black laptop stand will hold laptops that are up to seventeen inches in size. It is sturdy, light, strong, easily adjustable, and versatile. It is something that you can rely on to hold up your laptop. A great advantage of this laptop stand is that does not require you to assemble anything. The second you get it, you can start using it without spending any time trying to figure out how to put it together. It is easy to use this relatively large laptop stand for almost anything. Of course, it will support your laptop. However, it can support almost anything else if it is not unrealistically big. You can get the PWR+ Laptop Stand for a very reasonable price. It comes with a good warranty, so you know that you will be getting yourself a product that you can trust. 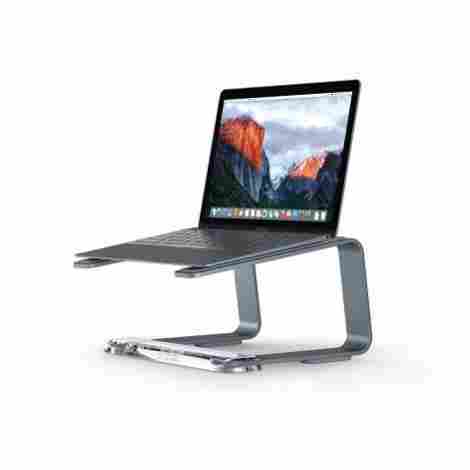 This is a cool adjustable laptop stand that has a nifty brushed steel look and is also completely adjustable for your writing, browsing ease. It’s made of a nice iron strengthened nylon and stainless steel which adds to the cool factor, but also makes it sturdy. All in all a great little laptop stand. This is a pretty cool element because some of the stands we’ve reviewed are just that and you have to carry a fairly bulky (though lightweight) stand with you if you’re working remotely. This folds up in much the same way as your laptop so you’re left with a flat plate instead of a more bulky stand. This has an adjustable height to allow you to set the exact angle at which you want to work. We like this because people are different and having an adjustable function makes gives users just a bit more flexibility. And flexibility is always good. This comes at a great price, and so it comes late on our list we like to think of it as a hidden gem. It looks cool, it works well, it’s foldable and lightweight, and for that reason it’s a great choice for the worker who wants to get their laptop off the ground. The universal construction of this elevator laptop stands means that it works for laptops, PCs, and Macs. It holds your laptop 5.5 inches higher than it would normally stand. With 360 degrees of air circulation, this laptop stand is going to keep your laptop nice and cool, so you are never going to have to worry about your computer overheating. The small and space saving design of this laptop stand makes it very easy for travel. Additionally, it disassembles and reassembles easily, which definitely is an advantage. After all, since most people use laptops for their portability, you also want the stand that you use with it to be just as portable. The gold Griffin Elevator Desktop Stand will cost you a very, very reasonable amount. No matter what kind of laptop you have and no matter what you use it for, there is going to be a high-quality laptop stand out there that works well for you. Some laptop stands are designed for smaller laptops. Some are designed for laptops that do tasks that may cause a little bit of overheating. Some are good for the heavier laptops. Some work well if you are working at a desk. Some are designed to be versatile and serve multiple purposes. Whatever your specific case is, you should not have any difficulty finding a laptop stand that suits you. You just have to figure out what your exact needs are and then you can pick out a good laptop stand. It will be great for your health because the stands prevent slouching and slumping over. It will improve your productivity because discomfort in the workplace can result in elevated stress levels. Many of the stands will also look great at your workplace. They can help you stay organized and give your office a classy look. They are also usually very portable with features that make them light and easy to store, so you can take them wherever your laptop goes. If you get the right model, you will eventually never go anywhere with your laptop without bringing the stand as well. 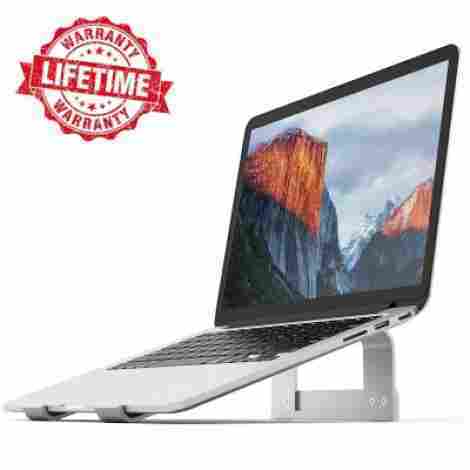 With many different styles, sizes, materials, designs, features, and prices, it may be difficult to decide what exactly you need to look for in order to pick out a laptop stand that works well for you. In order to properly evaluate what kind of laptop stand reaches a high standard, the stand must meet certain criteria that sets it apart from substandard stands. These are the criteria that you should be paying attention to in order to make sure that you are as comfortable and as satisfied with your choice as possible. As long as you know what criteria you need to look out for, it should not be too difficult to figure out what type of stand is going to suit both you and your computer. The whole point of a laptop stand is to keep you and your body at ease. The more comfortable a stand is going to make you feel, the better it is. The best laptop stands are going to make you feel so comfortable that you will not know how you could have possibly survived without it. In order to ensure maximum comfort, laptop stands are going to have to be somewhat adjustable. After all, everyone has a different body and different preferences for how to sit, stand, or lie down while working. Additionally, every time you shift as you work, you need your computer and laptop stand to be able to shift a little bit with you. You should be able to adjust both the height and the angle of your laptop in order to ensure maximum comfort. It is possible that you already know what height is going to be good for you, which means that you can choose a stand that comes to a fixed height. However, the chances are pretty high that you are probably going to want to adjust the height, especially if you work in many different places with many different types of chairs and desks. If you like the screen higher up and your keyboard lower down, then you are going to need a laptop stand that allows you to have enough room for a keyboard on your desk. If you like being able to work both standing up and sitting down, then you are going to need a stand that has a very wide height range. Whatever your height and angle requirements, you should be able to find a high-quality laptop stand that makes you feel comfortable. If your laptop stand cannot support your computer, then you might be a little unsatisfied with the product. Therefore, you want to make sure your laptop stand is made from the right materials. Durability is important when it comes to support, but friction is also something that you have to think about. If your computer starts sliding around on the stand, then you might run into some problems. When something is resting on top of something like a laptop stand, it has a lot of potential energy because it is relatively high up. While it is beneficial to raise your laptop, it also puts it at a higher risk of falling over and breaking because of the extra potential energy. Therefore, you want to be able to trust that your computer is not going to slide off the stand. Hooks, ledges, and rubber grips will help to keep your laptop in place. Grips at the bottom of the stand will also help with keeping the stand itself in places. The best laptop stands are also going to be made from materials that you can rely on, so you will not have to worry that the stand is going to collapse on you, sending your laptop crashing dangerously into a hard surface. No matter how much you tilt the angle, a good laptop stand will ensure that your laptop is safe and secure. One of the main reasons people choose a laptop over a desktop monitor is that a desktop monitor is going to have to stay in one place. You cannot carry it around with you all that easily. However, laptops are supposed to portable. If your laptop stand cannot travel with your actual laptop, then you will only be comfortable while working some of the time, but there should never be a moment when you feel discomfort. Therefore, your laptop stands must be just as portable as your laptop is. The best laptop stands are going to made from lighter materials, making them easy to carry around. After all, if you have to carry around a super heavy stand, it can hurt your back, which definitely ruins the point of using a laptop stand for the sake of improving your posture. The best laptop stands will also be collapsible, foldable, or simply small in order to ensure that they can fit in any computer bag or storage space. Even if you have a big laptop and a big stand to support that laptop, you should be able to transport both of them with relative ease. Although the lightest materials are slightly more expensive than other materials, a good laptop stand will be engineered well enough to minimize the cost and maximize the portability. If your laptop stand breaks, then you are going to have to replace it. In order to make sure that you get what you paid for, you need a laptop stand that is not going to break on you the second you get it. You definitely want to be able to get plenty of use out of your stand before you finally need to get a replacement. You also do not want your stand to break while you are using it because it can actually put your computer at risk of breaking too. The best laptop stands are going to made out of sturdy and durable materials. 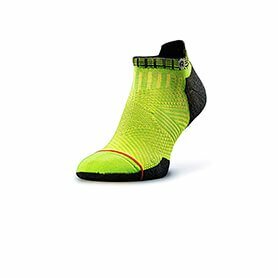 They will also have designs that will minimize the chance of breaking. 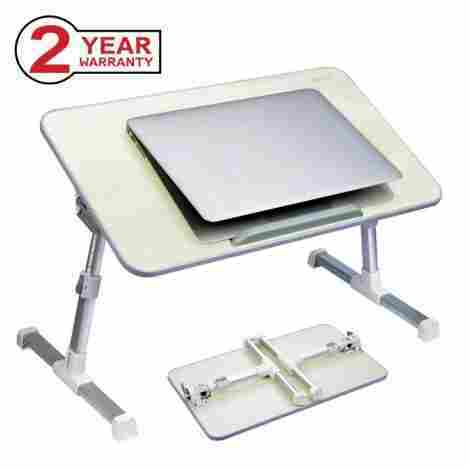 Additionally, many laptop stands come with some sort of warranty, which shows that you can probably trust that the manufacturers did a good job of ensuring that your stand is not going to break on you. Some laptop stands have complicated notches that make adjusting the stand difficult and confusing. Therefore, you want to find a laptop stand is easy for you to use. You do not want to spend too much time figuring out how to fix the height, lock the tilt, or fold up the entire thing. Just because a laptop stand comes with great features does not mean that the engineers are allowed to be lazy about ensuring that the stands are not too difficult to use. The best laptop stands are going to be simple, so you are not going to have to worry about getting confused about making sure that the laptop stand works properly. The best laptop stands are going to be able to support a variety of different laptop sizes. Some of them can even support smaller tablets. However, if you know that you have an especially big or small laptop, then there are highly regarded laptop stands that are specifically designed for your needs. Especially if you have a heavier laptop, you may want to find a stand that was engineered to take a lot of weight without breaking. Size all matters when it comes to taking up space on your desk. If you need to have certain items on your desk, then you definitely want the size of your laptop stand to be on the smaller side. Otherwise, you may have difficulty keeping your desk organized. Some people have Macs, and some people have PCs. However, laptop stands should be compatible with lots of different types of computers. Of course, some stands are better for a specific type of computer, and there is nothing wrong with choosing a laptop stand that does not have universal construction. 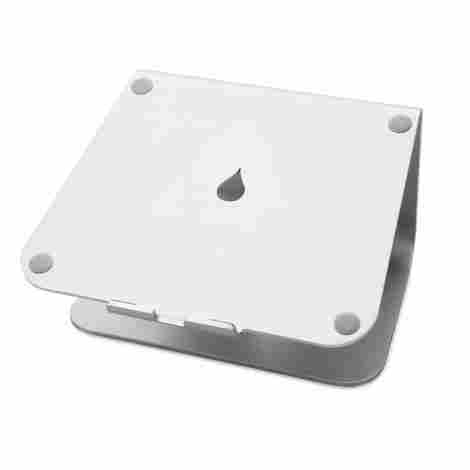 However, you need to make sure that your laptop stand is compatible with the type of computer that you have. The additional features on some laptop stands might cause a bit of a price increase. However, sometimes, you may really need these additional features. For example, many laptop stands boast features that prevent overheating. Some have fans. Some are made from cooler materials. Some have holes on the bottom to allow hot air to ventilate. If you know that your computer is prone to getting very warm, you want these cooling features. Even if your laptop does not overheat, these features can be a definite bonus just in case your laptop begins to overheat as it ages. Cooling systems are not the only additional feature that often comes with a laptop stand. Some stands come with a mouse, a mousepad, storage space, or extra pins to make sure the stand is sufficiently sturdy. If you think you may benefit from these features, then you want to find a stand that includes them. Luckily, many of the best stands are going to boast plenty of these extremely advantageous features. If you are going to pay a lot of money for a laptop stand, then you want to make sure it was worth your money. While some of the best stands might be a little bit pricey, they are going to be a product that you can trust. They will last a long time, they will do what they were designed to do, and they may come with lots of great features that you benefit from. As long as your laptop stand is highly regarded, you can rest assured that it is going to be worth your money. When it comes to laptop stands, functionality may be a lot more important than the way it looks. However, a good office look can actually boost your productivity levels. Additionally, there is nothing wrong with wanting to have a laptop stand that is not too much of an eyesore. Luckily, all the best laptop stands are going to be relatively attractive. They may even come in many different colors so that you are better able to find one that suits your aesthetic needs. The most expensive ones will definitely look higher end. However, the cheaper ones are not going to make you cringe every time you look at them unless you are particularly picky about how things look in your workplace environment. Q: Do the laptops stands come fully assembled? A: Sometimes, laptops stands can do come preassembled. After all, they are designed to be easy to transport, so some laptop stands will not require any sort of assembly. However, other times, you will have to assemble your stand on your own. It really is just going to depend on what you choose. Q: Will these stands be able to hold desktop computers or monitors? A: Some of the stands are incredibly strong, and they can hold basically anything. Usually, the user manual will tell you the weight and size of the different objects that it can support. Q: Does it get harder to type when the laptop is elevated? A: Usually, it actually gets easier to type with the laptop stands. You will type with more accuracy and with added comfort. With the right product, you should not have any difficulty with typing. Q: Does it make a difference if you tend to work at a desk or couch? A: The place where you work can make a difference. Some laptop stands are specifically designed for desk use. Others are better if you are lying down in your bed. From the pictures, you can usually tell what your laptop stand was specifically designed to do. If you know that your workplace can vary, then the good news is that some laptop stands work well in any location. These laptop stands do tend to be the more expensive ones, but it might be worth it if you know that you need added comfort in many different work locations.